The objective of the International Associated Laboratory “LIME” is to prepare and characterize ionomer materials for electrochemical energy technologies. Aromatic polymers are very attractive given their easy functionalization, low cost and easy recycling. Among the many aromatic polymers, we focus mainly on Poly(ether-ether-ketone) (PEEK), Poly(phenyl-sulfone) (PPSU), Polysulfone (PSU), and Poly(ether-sulfone) (PES). Proton conducting ionomers are materials of choice for fuel cells and water electrolysis. The properties can be improved by innovative thermal treatments for annealing and cross-linking (XL-SPEEK) the macromolecules. Various cations can be introduced by ion exchange or chemical reaction (e.g. with butyl-Li). The ionomers can be used as separators for rechargeable batteries (in anhydrous state) or for aqueous metal batteries. The most common ionomers contain quaternary ammonium groups. The basic operating conditions allow using non-noble electrocatalysts for the oxygen reduction reaction and thus an important cost reduction for alkaline fuel cells and water electrolysers. They can be prepared by ion exchange from hydroxide conducting ionomers or by innovative synthesis by reaction of acids with basic groups (e.g. sulfonamides). Such ionomers are especially useful for redox flow batteries, where cation permeability must be minimized. Acidic and basic groups coexist in a single macromolecule: the type and value of the ionic conductivity depends on the pH of its environment. This versatility and the low ionic permeability are very useful for technologies requiring low ion permeability. Ionomer separators for electrochemical energy technologies are produced from the microscale (microbatteries based on TiO2 nanotubes) to the macroscale (redox flow batteries). The characterization techniques include spectroscopies (FTIR, UV and NMR), thermogravimetry, mechanical tests, permeability measurements, impedance spectroscopy and electrochemical measurements, such as cyclovoltammetry and galvanostatic polarization. Braglia, M; Ferrari, I.V. ; Pasquini, L.; Djenizian, T; Sette, M.; Di Vona, M.L. ; Knauth, P. Electrochemical synthesis of thin, dense, and conformal anion exchange membranes with quaternary ammonium groups Electrochimica Acta 2018, 265, 78-88. Pizzoferrato, R.; Ciotta, E.; Ferrari, I.V. ; Braglia, M.; Medaglia, P.G. ; Mattoccia, A.; Di Giamberardino, L.; Richetta, M.; Knauth, P.; Di Vona, M.L. Ionic conductivity of Zn–Al layered double hydroxide films grown on aluminum substrate Solid State Ionics 2018, 314, 30-35. 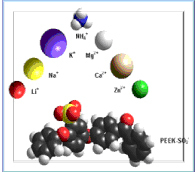 Knauth, P.; Pasquini, L.; Di Vona, M. L. Comparative Study of the Cation Permeability of Protonic, Anionic and Ampholytic Membranes. Solid State Ionics 2017, 300, 97-105. Ferrari, I. V.; Braglia, M.; Djenizian, T.; Knauth, P.; Di Vona, M. L. Electrochemically Engineered Single Li-Ion Conducting Solid Polymer Electrolyte on Titania Nanotubes for Microbatteries. J. Power Sources 2017, 353, 95-103. Di Vona, M. L.; Casciola, M.; Donnadio, A.; Nocchetti, M.; Pasquini, L.; Narducci, R.; Knauth, P. Anionic Conducting Composite Membranes Based on Aromatic Polymer and Layered Double Hydroxides. Int. J. Hydrogen Energy 2017, 42, 3197-3205. 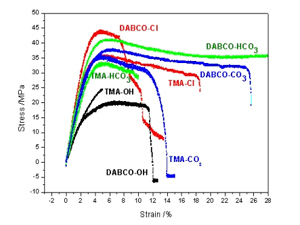 Derbali, Z.; Fahs, A.; Chailan, J. F.; Ferrari, I. V.; Di Vona, M. L.; Knauth, P. Composite Anion Exchange Membranes with Functionalized Hydrophilic or Hydrophobic Titanium Dioxide. Int. J. Hydrogen Energy 2017, 42, 19178-19189. Braglia, M.; Ferrari, I. V.; Djenizian, T.; Kaciulis, S.; Soltani, P.; Di Vona, M. L.; Knauth, P. Bottom-up Electrochemical Deposition of Poly(Styrene Sulfonate) on Nanoarchitectured Electrodes. ACS Applied Materials & Interfaces 2017, 9, 22902-22910. Alberti, G.; Narducci, R.; Di Vona, M. L.; Giancola, S. Preparation and Nc/T Plots of Un-Crystallized Nafion 1100 and Semi-Crystalline Nafion 1000. Int. J. Hydrogen Energy 2017, 42, 15908-15912. 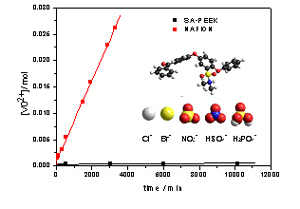 Pasquini, L.; Di Vona, M. L.; Knauth, P. Effects of Anion Substitution on Hydration, Ionic Conductivity and Mechanical Properties of Anion-Exchange Membranes. New J. Chem. 2016, 40, 3671-3676. Narducci, R.; Pasquini, L.; Chailan, J. F.; Knauth, P.; Di Vona, M. L. Low-Permeability Poly(Ether Ether Ketone)-Based Ampholytic Membranes. CHEMPLUSCHEM 2016, 81, 550-556. Narducci, R.; Chailan, J. F.; Fahs, A.; Pasquini, L.; Di Vona, M. L.; Knauth, P. Mechanical Properties of Anion Exchange Membranes by Combination of Tensile Stress-Strain Tests and Dynamic Mechanical Analysis. J. Polymer Science Part B-Polymer Physics 2016, 54, 1180-1187. Barbieri, G.; Brunetti, A.; Di Vona, M. L.; Sgreccia, E.; Knauth, P.; Hou, H. Y.; Hempelmann, R.; Arena, F.; Beretta, L. D.; Bauer, B.; Schuster, M.; Osso, J. O.; Vega, L. F. LOLIPEM: Long Life Proton Exchange Membrane Fuel Cells. Int. J. Hydrogen Energy 2016, 41, 1921-1934. 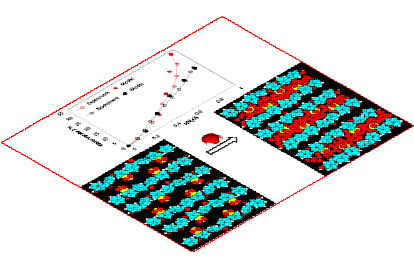 Pasquini, L.; Ziarelli, F.; Viel, S.; Di Vona, M. L.; Knauth, P. Fluoride-Ion-Conducting Polymers: Ionic Conductivity and Fluoride Ion Diffusion Coefficient in Quaternized Polysulfones. CHEMPHYSCHEM 2015, 16, 3631-3636. 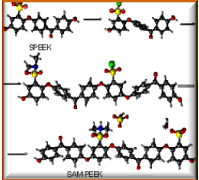 Pasquini, L.; Knauth, P.; Pelzer, K.; Di Vona, M. L. Anion-Conducting Sulfaminated Aromatic Polymers by Acid Functionalization. RSC Advances 2015, 5, 56636-56644.